Plot sign up will happen for Garden of Eatin' Community Garden in Eureka at the annual garden meeting on Saturday March 4 at 10:30 a.m. at the garden located at Calvary Lutheran Church, 716 South Avenue, just south of the Eureka Mall. Plots are 12' x 4' and rented annually for $22. The meeting will be inside the church's Fireside Room (enter on Prospect Street). For questions please contact Suzanne at (707) 839-1560. There are open plots available at the McKinleyville Community Garden at Pierson Park. The cost is $20/year for a 3' x 10' plot and access to communal space for row crops. The fee includes water and access to some tools and supplies like compost located on site. To reserve a plot contact the McKinleyville Community Services District's Parks & Recreation office at (707) 839-9003. Questions may also be directed to gardener Jamie at (707) 407-9012. This youth-led garden in Willow Creek is hosting a free workshop on permaculture gardening principles on Saturday March 18 at 10 a.m. The "Build a Guild" workshop is led by Dan Mar of High Tide Permaculture. is located next door to the Willow Creek Post Office. For information call Nick at (530) 629-3564. Located on the corner of 6th and T Streets in Eureka in the backyard, on property of Redwood Community Action Agency (RCAA), is Abuelita's Garden. It provides fresh food grown organically and year-round, and gardening opportunities, for clients of RCAA's homeless shelters. The garden is welcoming more volunteers from the community, and volunteering is a great way to learn and share gardening tips. The garden has recently experienced theft of the tool shed onsite and several acts of vandalism. We are looking to replace tools including pruning loppers and hand clippers. We are asking the community for help in replacing tools and in providing more "eyes" on the space - please consider going by the garden when you are in the neighborhood or getting involved as a volunteer. For more information or to support or get involved with the garden, please call Debbie at (707) 269-2071. There is space for more gardeners at Unity Community Garden. If you are interested, please come to a garden meeting on Saturday March 18 at 10 a.m. The garden is located on the corner of 15th and California Streets in Eureka. Plots will be assigned on a first come first serve basis for a sliding scale fee of $25-40 to cover water and basic maintenance. The garden features raised beds, fruit trees, and berry bushes. The garden is managed with a combination of communally-tended and individually-managed plots. Existing gardeners need to attend the meeting to reserve their plot for 2017. Rules and responsibilities will also be discussed, including to help maintain communal spaces and attend meetings and workdays. Please direct questions to garden coordinator, Dorine, at dor.leisz@gmail.com or (707) 616-5402. There are commuity gardens with space for more participants through Open Door Health Clinics in five North Coast communities. Some have regular volunteer days and times, including in Willow Creek (1st and 3rd Wednesday of the month from 9 am - 12 p.m), Arcata (Fridays from 11 a.m. to 1 p.m.), Eureka (Thursdays from 10 a.m. to noon), and Fortuna (Tuesdays from 11 a.m. to 1 p.m.). For more information or to get involved with these gardens please contact garden@opendoorhealth.com or (707) 269-7073 ext. 3158 or 3179. (707) 465-1988 x 6116 or jmoran@opendoorhealth.com. If you are looking for space to garden this upcoming season, there are community gardens with room for more participants. A list of local gardens and contact information is available through the Local Garden page of our website, www.northcoastgardens.org. Or contact Debbie to get in touch with a garden near you - (707) 269-2071 or debbiep@nrsrcaa.org. Did you know CalFresh (formerly food stamp) benefits can be used to purchase seeds and starts for growing food? Local farmers sell varieties that do well in our climate and many Farmers' Markets accept CalFresh. Some grocery stores sell seeds/starts also such as North Coast Co-op, Eureka Natural Foods, Murphy's, Ray's, Safeway, and Walmart. Now is a great time to start planning, and even planting, your spring garden. Planting charts for the coast and inland are available at northcoastgardens.org/?page_id=102. A free pruning workshop last Saturday February 25 drew 75 people to Abuelita's Garden on a bright sunny morning. Deborah Giraud, Farm Advisor for the University of California's Cooperative Extension in Humboldt and Del Norte, demonstrated pruning techniques for young, more mature, and espaliered fruit trees. Espaliered trees are trained to grow flat such as along a wall. They save space, are often easier to harvest from, and can create a "living fence." Participants were offered many free resources on pruning and caring for fruit trees as well as free gardening resources from North Coast Community Garden Collaborative, a network of local community gardens. Abuelita's Garden is located on the corner of 6th and T Streets in Eureka in the backyard, on property of Redwood Community Action Agency (RCAA). It provides fresh food grown organically and year-round, and gardening opportunities, for clients of RCAA's homeless shelters. Volunteers from the community are welcome, and volunteering is a great way to learn and share gardening tips. For more information about the garden or to get involved, please contact Debbie at DebbieP@nrsrcaa.org or (707) 269-2071. 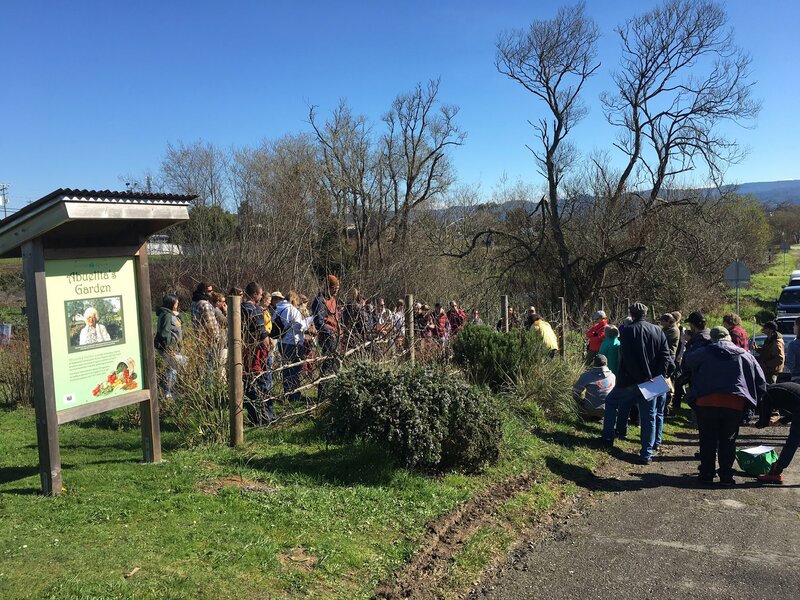 A free workshop on pruning fruit trees drew 75 residents to Abuelita's Garden in Eureka last Saturday February 25. Local community gardens of North Coast Community Garden Collaborative seek support from the community in meeting supply needs for the upcoming growing season. Items needed include seeds and plant starts for growing food, tools including gloves of all sizes, organic fertilizers and amendments, mulches, irrigation supplies, and lumber for building raised beds. If you are able to donate any of these supplies or money to purchase them please contact Debbie at (707) 269-2071 or debbiep@nrsrcaa.org. Donations are tax deductible through our fiscal sponsor, Redwood Community Action Agency, a local 501(c)(3) non-profit. Checks may be made payable to Redwood Community Action Agency with "NCCGC" in the Memo field, and mailed to RCAA, 904 G Street, Eureka, CA 95501. North Coast Community Garden Collaborative is a support network of and for community gardeners, working to increase access to healthier lifestyle choices, particularly access to nutritious, locally-grown, and culturally appropriate foods. More information can be found on our website, www.northcoastgardens.org, or call (707) 269-2071. - How to Get Free Honey Bees: Friday March 3 from 6 - 8 p.m. at the Agriculture Center, 5630 South Broadway St (take the Humboldt Hill Road exit of HWY 101). This Humboldt County Beekeepers Association (HCBA) General Meeting will feature guest speaker, Paul Leslie, a local beekeeper and owner of Humboldt Honey Wine. For more information about the talk or HCBA, please visit humboldtbeekeepers.org/ or contact Justin at (760) 505-9021 or justinmreeve87@gmail.com. - Garden of Eatin' Meeting and Plot Sign Up: Saturday March 4 at 10:30 a.m. at the garden located at Calvary Lutheran Church, 716 South Avenue in Eureka just south of the Eureka Mall. The meeting will be inside the church's Fireside Room (enter on Prospect Street). See opposite column for details. For questions please contact Suzanne at (707) 839-1560. - Eureka General Plan Update Special Study Session: Tuesday March 7 from 4 - 5 p.m. at the Council Chambers on the 2nd Floor of Eureka City Hall, 531 K Street. There is time for public comment at the beginning of this informational public meeting with the City Council and Planning Commission. Land Use will be discussed. Join North Coast Community Garden Collaborative in supporting language that promotes community gardens and community food production. More information including more upcoming public meetings may be found at www.eureka2040gpu.com. - POSTPONED: Local Food Production and Cannabis Legislation: Previously scheduled for Tuesday March 7, this free educational event for the community has been postponed. Updated information will be posted at www.northcoastgardens.org or contact may.patino@humboldt.edu or (707) 826-3409. - LatinoNet Annual Meeting and Board Elections: Friday, March 10 from 12 - 1:30 p.m. at the Jefferson Community Center located at 1000 B Street in Eureka. During this meeting, we say goodbye to exiting members of our Board of Directors and elect new members who will steer the work of LatinoNet. For more information about applying to serve on the Board or about LatinoNet please contact hclatinonet@gmail.com or (707) 442-5239. - Monthly Meeting of North Coast Community Garden Collaborative: Wednesday March 15 from 4:30 - 6 p.m. at Redwood Community Action Agency, 904 G Street in Eureka. NCCGC asks gardens with which we work to attend one monthly meeting per year either in person or by phone (502-9524). We are also looking for more people to join our Steering Committee, which oversees the NCCGC and includes representatives of local community gardens and supportive partners such as Food for People, University of California Cooperative Extension, and Open Door Community Health Centers. For more information about the monthly meeting or becoming a Steering Committee member, please contact Debbie at (707) 269-2071 or DebbieP@nrsrcaa.org. - Fermenting Sauerkraut: Friday March 17 from 12 - 1 p.m. at the Community Wellness Center, 908 7th Street in Eureka. Free demonstration by Master Food Preserver volunteers of University of California Cooperative Extension. Learn to make a tart crunchy treat with fresh cabbage. Learn to love lactobacilli! Space is limited so reserve your spot today by emailing bell@humboldt.edu. 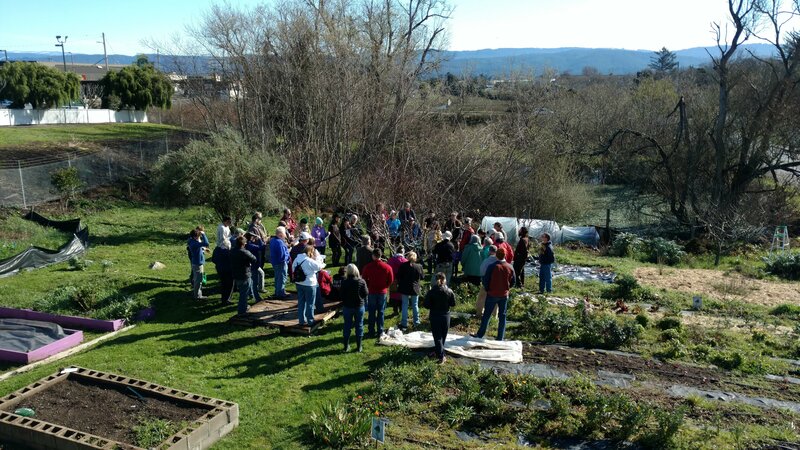 - Unity Garden Meeting and Plot Sign Up: Saturday March 18 at 10 a.m. at the garden on 15th and California Streets in Eureka. See opposite column for details or contact Dorine at dor.leisz@gmail.com or (707) 616-5402. - Build a Guild Workshop: Saturday March 18 at Dream Quest Demonstration Permaculture Garden in Willow Creek. Dan Mar of High Tide Permaculture presents this free workshop. For more information about the workshop see opposite column or contact Dream Quest at (530) 629-3564. @gmail.com, or call (707) 269-2071. - Community Garden Workday: Friday March 31, in honor of Cesar Chavez Day. For details, please check back at www.northcoastgardens.org. Gardening Gazette is a free publication of North Coast Community Garden Collaborative, a support network of and for local community gardeners who work together to improve people's access to healthier lifestyle choices - particularly access to nutritious, locally-grown, and culturally appropriate foods, by creating and nurturing partnerships of community garden groups and their supporters. Some of our many supportive partners include University of California Cooperative Extension, Open Door Community Health Centers, Food for People, Master Gardeners, Community and Family Resource Centers, and community members. Learn more at www.northcoastgardens.org or "North Coast Community Garden Collaborative" on Facebook.